Excel2R imports MS Excel spreadsheets into Autodesk® Revit® projects and retains your style settings. 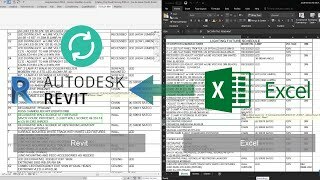 It's easy to create tables and keep them updated because whenever you update your Excel spreadsheet, the Revit table will also be updated. Use Excel2R when you need to quickly insert Excel data into your Revit projects. By downloading the Excel2R App, you will also receive our TOOLS4BIM Dock. The Dock gives you the option to install additional Revit add-ons developed by AGACAD. These other Revit extensions cover a range of industries, including Metal & Wood Framing, Ventilated Facades, Curtain Walls & Panels, Precast Concrete, MEP, and more. The trial version and full version are both included in the Excel2R app. After downloading the app, you will have the option to take a free 14-day trial or to purchase. Activation codes are sent via email.